What should one observe within the first days after the removal of a ganglion cyst? As true as for any surgery wound, after the removal of a ganglion cyst of the wrist the wound needs to be examined to ensure a regular healing course. Swellings and interferences with the healing process are not common – but they are possible. The image shows the regular appearance of a wound after the removal of a large ganglion cyst of the wrist. If no swelling shows for the first change of dressing, the mini-drainage may be removed. Laying a drainage typically is only required when operating on larger ganglions. Is a cast immobilization required? It is not a mandatory requirement to immobilize the wrist after the removal of a ganglion cyst. Many surgeons opt for this approach to secure a smooth healing process within the first days. In addition the cast will help reducing the pain during the first days after surgery. The pictured cast used to immobilize the wrist shows that the mobility of the fingers and the thumb remains unhampered. How long will the stitches have to stay in place after surgery on a ganglion cyst of the wrist? Provided the wound heals properly, the stitches in connection with the removal of a ganglion cyst of the wrist may be pulled after ten to fourteen days. 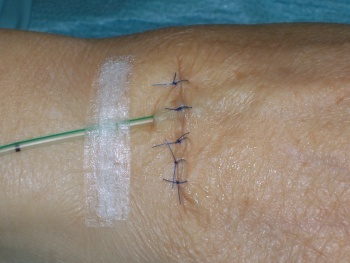 The removal of sutures from the wrist is usually not painful. As long as the wound is healing properly I usually change the dressing two to three times during the first weeks in order to inspect the wound. If the healing process is exceptionally good, one to two changes of dressing per week will suffice. One to two days after removing the stitches no more dressing at all is required, as long as the wound appearance is regular. Is the administration of drugs as part of the postoperative care a mandatory requirement? In case of swellings and pain in addition to the cast immobilization it may be appropriate to administer anti-rheumatics or similar working anti-rheumatic agents. These drugs do not only alleviate the pain, they also have an anti-inflammatory, de-swelling effect which helps enhance the healing process. I always recommend never to take any medications without first consulting with your family physician as these drugs also come with a variety of side-effects. (for example risk to develop a gastric ulcer). Typically the pain experienced after surgery responds fairly well to conventional pain-killers like Novalgin® or Paracetamol®. 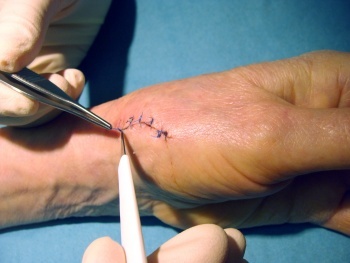 Should a patient experience severe pain even after the removal of the stitches took place, splinting may be considered to alleviate the discomfort. Attention: The splint should not be used constantly. Is it normal to experience a loss of sensitivity in the area of the wrist or on the dorsal side of the hand? Many patients report a strange skin sensation in the area of the surgical scar. Only if a large cutaneous nerve was cut during surgery (please refer to potential risks during surgery) the “numb sensation” will remain and in addition an electrifying pain (neuroma) in the area of the injured nerve will develop. When can one expect to be able to fully use a hand that underwent surgery on a ganglion cyst of the wrist? A hand that underwent surgery on a ganglion cyst should gradually and slowly over several weeks and months be reintroduced to everyday exertions. One should allow several weeks or even months before returning to full usage of the hand. If you act to daring, the hand as well as the wrist will most likely hurt and swell up. The operating surgeon will be able to determine as of when the hand may be put to use without restrictions. Very important: Putting too much strain onto the hand/wrist may lead to the return of the ganglion cyst (recurrent cyst). Please note: An unlimited “green light” for particularly straining sport activities such as tennis or golf can only be granted six to nine months after surgery. I strongly encourage you to consult your treating physician particularly on this subject! Does postoperative care connected to the removal of a ganglion cyst require physiotherapeutic treatment or exercises? There is no “cookie-cutter-approach” to this question as every individual is different. Many patients who underwent surgery start putting their hand to use with excellent results shortly after the stitches were removed. I recommend practicing this individual physiotherapy in lukewarm water (5 times, 5 minutes daily) for about six weeks. It is also good advice to rub a greasy ointment onto the surgery scar several times a day during the first months. A patient, who, however, does not reacquire mobility capabilities corresponding to at least average levels, should be encouraged to engage in early physiotherapy. What is of great importance to a patient engaging in physiotherapy due to surgery on a ganglion cyst? It is of great importance that the performed exercises never lead to pain or swelling of the hand! A too intense exercise program is actually damaging to the healing process and rather leads to greater mobility dysfunctions as opposed to improve the process! Particularly after surgery on a ganglion cyst, passive physiotherapy which ignores the individual pain level of the patient leads to an elevated risk of a relapse. Should you run into a therapist who is not willing to address your individual needs it is best to change the therapist! Surgery on a ganglion cyst requires a great deal of patience on the part of the patient as well as of the therapist in charge. Will the scar linked to the removal of a ganglion cyst of the wrist remain very visible? Please be aware that scars on hands tend to remain sensitive for a greater period of time. The esthetic appearance of a scar varies from individual to individual. Some people genetically tend to excessive scarring. The great majority of scars on a wrist, however, will turn pale and be nearly invisible after approximately one year! What are the results that one may expect after the removal of a ganglion cyst of the wrist? In my experience more than ninety percent of the patients who had a ganglion cyst of the wrist removed are entirely pain-free or at least retained a neglectable level of pain within a half year after surgery. A slight reduction of mobility of the wrist particularly in the bending direction may be observed rather frequently. In the long term the relapse quota (recurrent cyst) runs at around twenty percent.